Steve Lucas forwarded a request from Barbara Russell, the Brookhaven Town Historian, to help identify two photos recently discovered in their archives. Steve wrote: "She was hoping that you could identify them as to date, event, place, and type of car. They appear to be a race and thought maybe one of the Vanderbilt Cup Races." Time to bring out the VanderbiltCupRaces.com CSI (Cup Scene Investigation) Team. The two photos recently found in the Brookhaven Town Archives. There were no captions or notations on the photos. A closer look reveal the distinctive numbers 7 and 8 on the cars. The long unusual hood of the #8 car will also help to identify the car and race. The CSI Team also note the distinctive white fence and dark fence bordering the road. A man can be seen waving a dark flag as the cars approach. The distinctive numbers on the cars and shape of the #8 car made identification very easy. 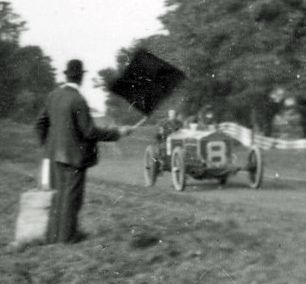 The two racers participated in the 1905 American Elimination Trial held two weeks before the Second Vanderbilt Cup Race. The race was held to help select the five American entries for the Vanderbilt Cup Race. The A.A.A. Racing Board will have the final power to select the five cars regardless of the outcome of the trial. 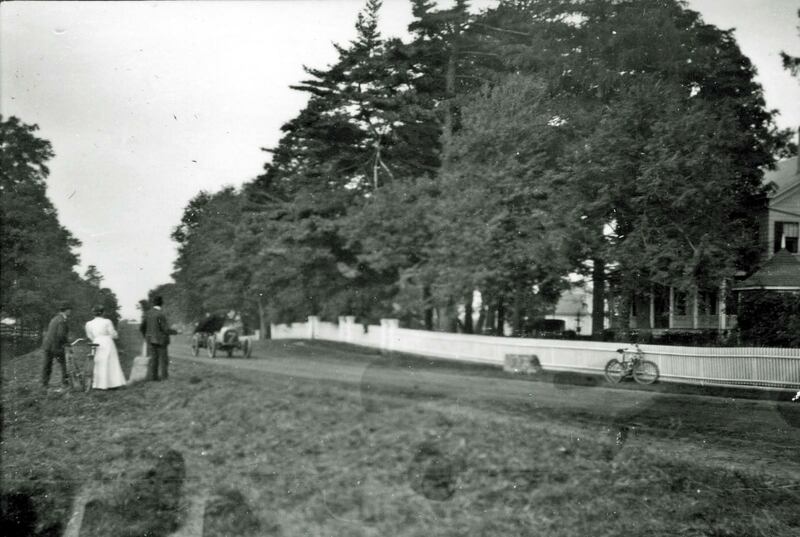 The two cars can be seen at the starting line on Jericho Turnpike in Mineola on September 23, 1905. 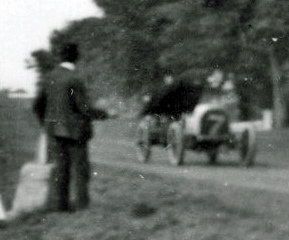 The #7 car was a 40-HP Royal Tourist driven by Robert Jardine. Although it finished third in the race, averaging 49.8 mph, it was not selected for the American Team. 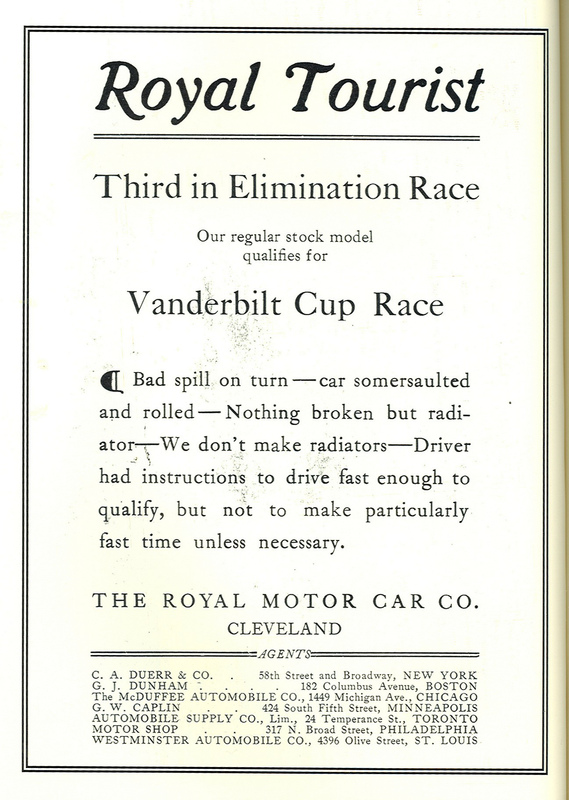 The Royal Motor Car Company placed this ad after its third place finish. "Bad spill on turn-car somersaulted and rolled- Nothing broken but radiator-We don't make radiators- Driver had instructions to drive fast enough to qualify, but not to make particularly fast time unless necessary." 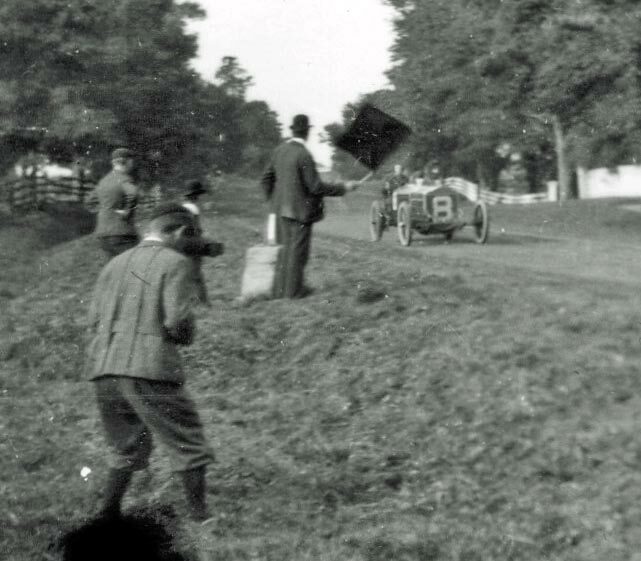 The #8 car with the long hood was a 60-HP Thomas driven by Montague Roberts. It finished 5th, averaging 45.4 mph. But, like the Royal Tourist, it was not selected for the American Team. 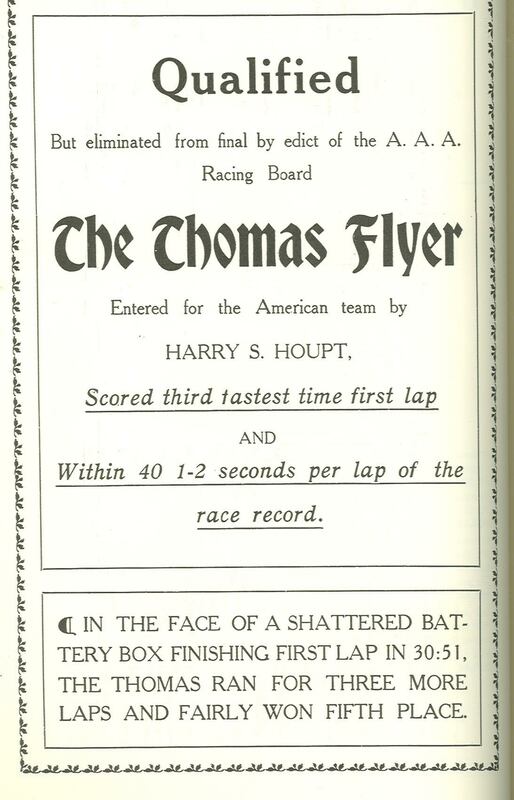 Harry Houpt, the owner of the car and a Thomas distributor, was not pleased with the decision to exclude his car from the Vanderbilt Cup Race. "Qualified-But eliminated from final by edict of the A.A.A. Racing Board." 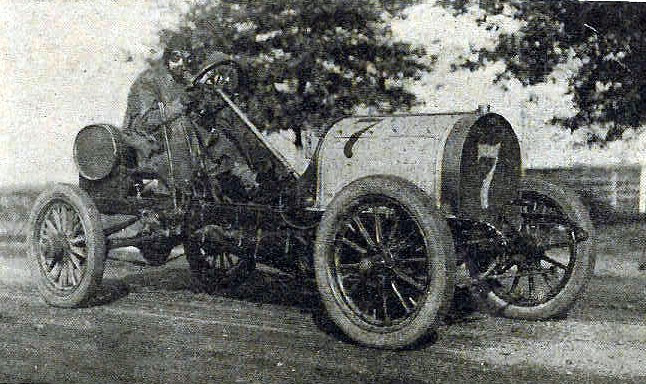 Driver Montague Roberts would unsuccessfully race another Thomas in the 1906 American Elimination Trial. 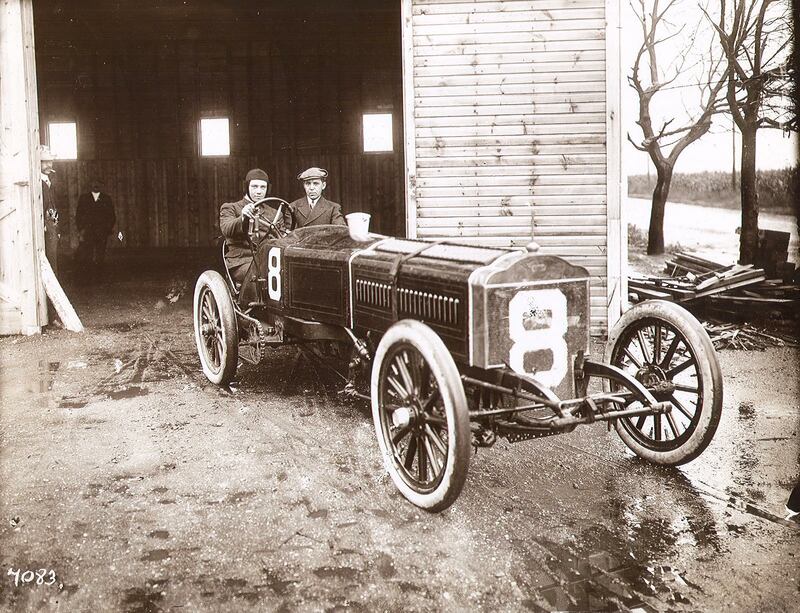 However, Roberts would later become one of the winning drivers of the Thomas entry in the 1908 New York to Paris Race. Determining the location of these photos was a greater challenge. The man waving the flag was an excellent clue. 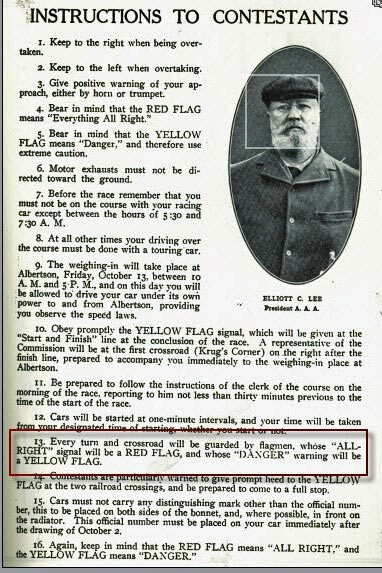 As noted in the 1905 Program Guide for the Vanderbilt Cup Race: "Every turn and crossroad will be guarded by flagmen, whose "ALL-RIGHT" signal will be a RED FLAG, and whose "DANGER" warning will be a YELLOW FLAG." 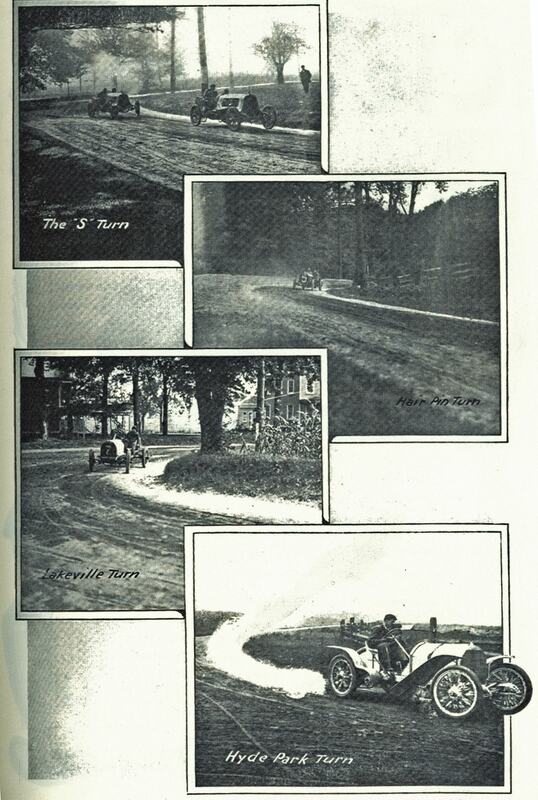 The same Program Guide provided photos of the eight major turns on the 1905 course. A close up of the Jericho Turn on Jericho Turnpike on to Jericho-Oyster Bay Road reveals the same fence configurations as seen in our two photos. 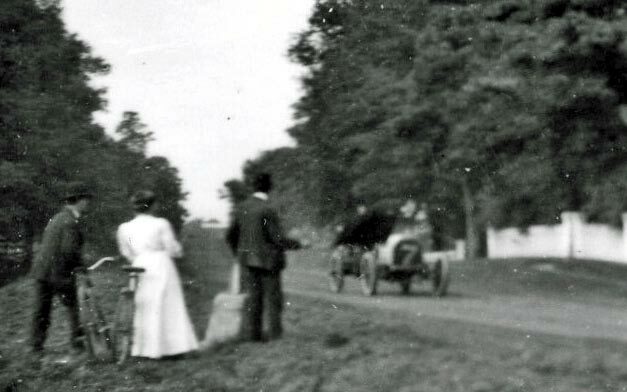 The two cars are the #7 Royal Tourist and the #8 Thomas which were entered in the 1905 American Elimination Trial held on September 23, 1905. 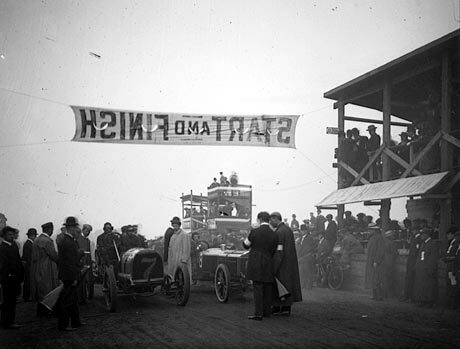 Both cars were not selected to participate in the 1905 Vanderbilt Cup Race. 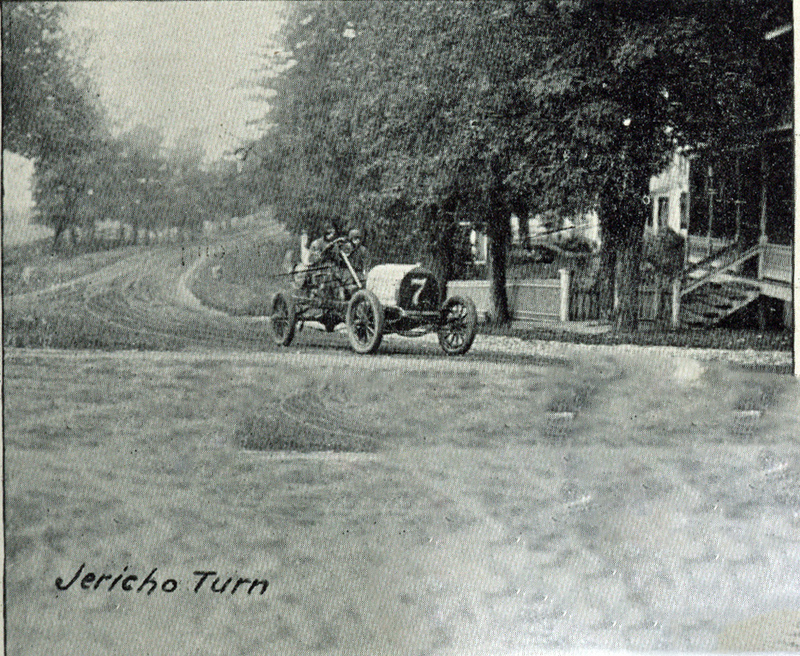 The likely location for the photos was the intersection of Jericho Turnpike and Jericho-Oyster Bay Road in the hamlet of Jericho. 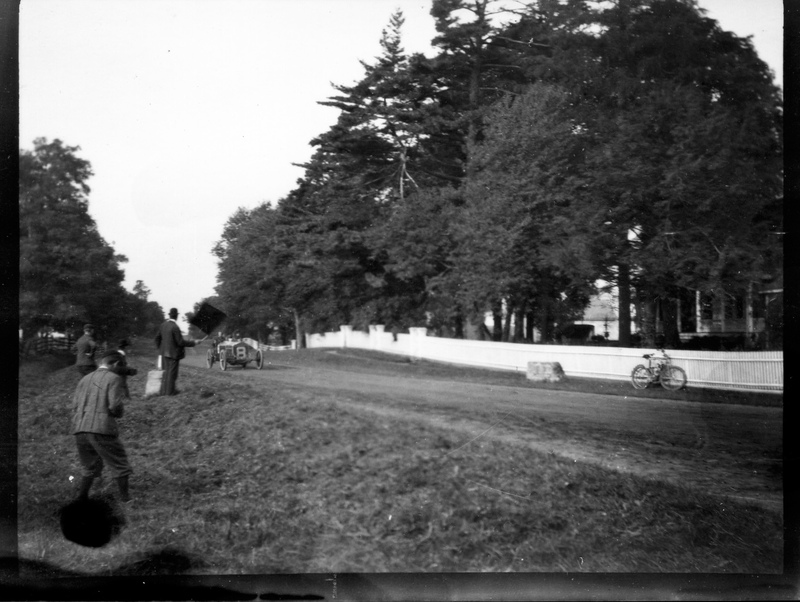 Given the small number of spectators seen at this popular turn on the 1905 and 1906 courses, the photos were likely shot during one of the practice runs for the 1905 American Elimination Trial held several days before the race. Can anyone remember where the “S turn” was on the Motor Parkway. 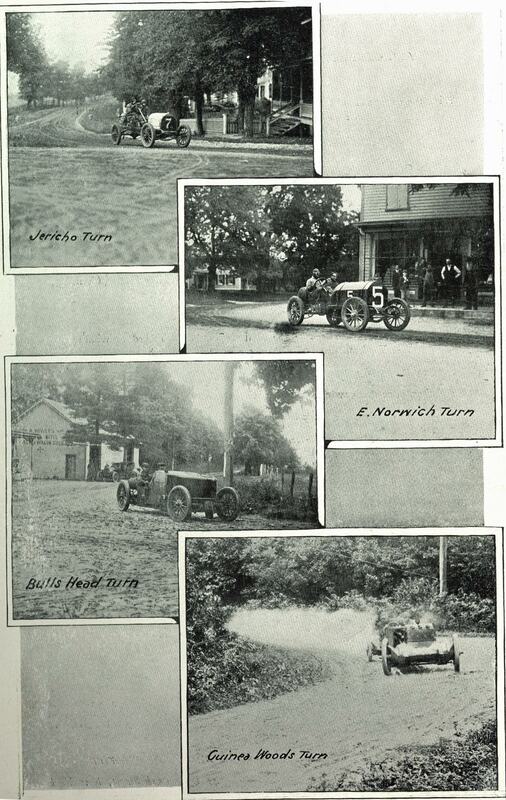 I remember an “S turn” about a mile from the Rosevale Avenue in Lake Ronkonkoma end of the Parkway. Could this be one of those turns mentioned that needed a flag man? 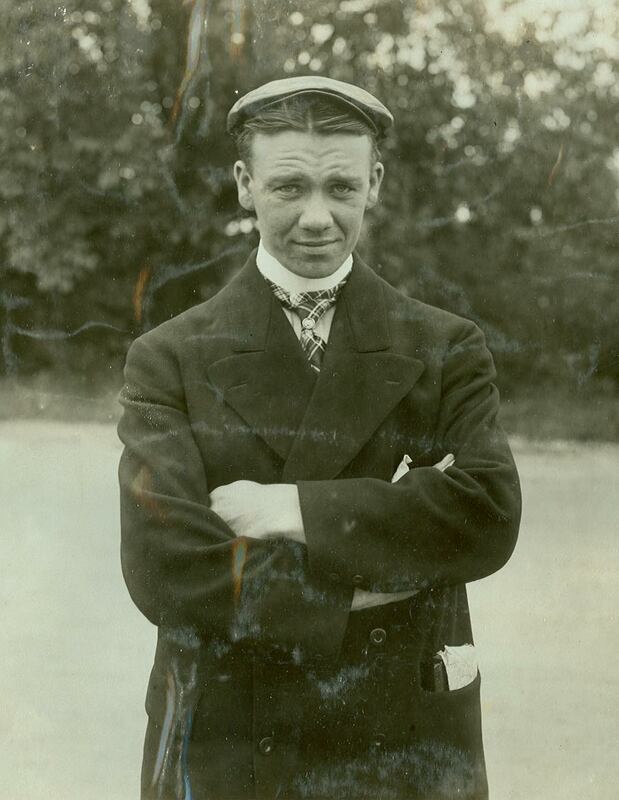 For the 1905 Vanderbilt Course, the “S Turn” was I.U. Willets Road in Albertson. I will feature it in a future post on VanderbiltCupRaces.com. This is an incredible road! How they raced it with cars from the era is amazing! I would love to try a run on any part of it! Montague Roberts was my great uncle. I have some wonderful photos of your great uncle and will post them later this week.